LEGENDS OF TOMORROW ended its season quietly. NBC: THE VOICE held at 1.9, and GOOD GIRLS gained 0.1 to 1.0. 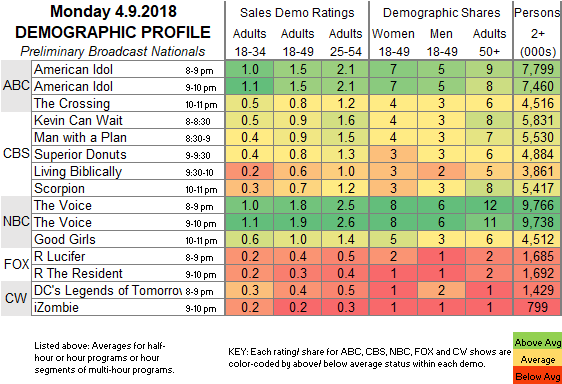 CW: The season finale of LEGENDS OF TOMORROW stayed at 0.4, and IZOMBIE held at its 0.2 from 2 weeks ago. CBS: The line-up returned from last week’s reruns with KEVIN CAN WAIT (0.9), MAN WITH A PLAN (0.9) and SUPERIOR DONUTS (0.8) all steady. 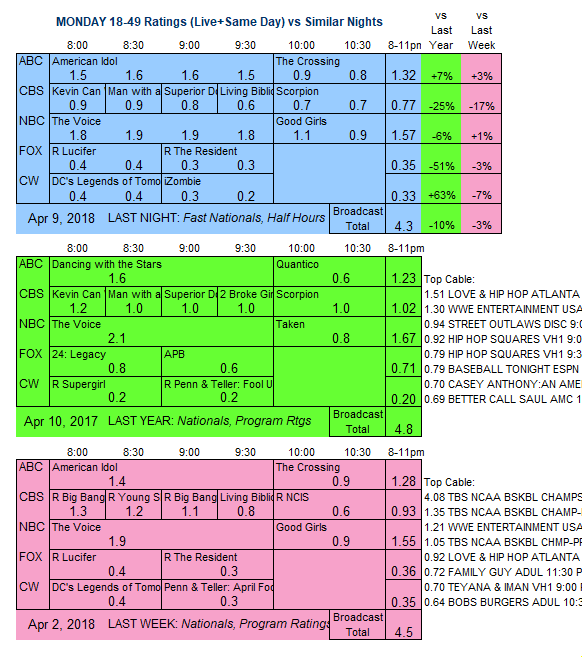 LIVING BIBLICALLY, which did air last week, but with a 1.1 BIG BANG THEORY rerun lead-in, fell 0.2 to 0.6. SCORPION dipped 0.1 from 2 weeks ago to 0.7. Tonight, FOX’s NEW GIRL begins its brief (8 episodes over 6 weeks) farewell season. On cable, VH1 airs the season finale of AMERICA’S NEXT TOP MODEL.